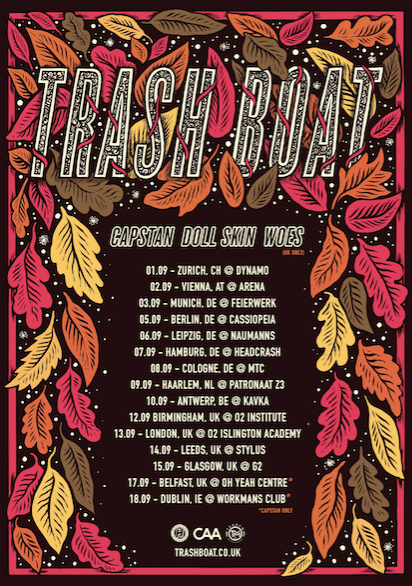 St. Albans punks Trash Boat will be hitting the UK and Europe in September for The Crown Shyness Tour! They will be joined by Capstan, Dollskin and Woes (Woes UK only!). “Crown Shyness was released in Summer 2018 while we were on Warped Tour. We barely had the end of the summer before we hit the road with As It Is. Then just a month later we joined While She Sleeps and we never really got a chance to do a Crown Shyness release tour. The album has been out for 6 months now and it’s about time we headlined! So we’re gunna smash a 1hr+ set and play a bunch of our old & new songs with some friends we’ve met along the way. I can’t wait to share it all with you guys! See you soon.” – Tobi Duncan.